Made by Atari in February 1978. 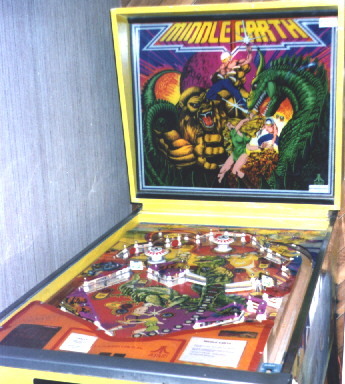 This is a sharp-looking 4-player machine typical of Atari's other machines produced during their short venture into the pinball manufacturing arena. Backglass: Scene of fantasy-style warriors, male and female, fighting various beasts. Note that most beasts shown on the game are dinosaur-types. Like many other Atari machines, this machine has no scoring displays in the backbox. The purpose of the backglass is purely cosmetic. The displays are located on the score card holder above the outhole. Playfield: Asymmetrical layout with two pop bumpers on the upper playfield. This is a wide-body machine with lots of open area. Two flippers are poised at the bottom of the upper playfield and two in the normal position on the lower playfield. Each playfield has a bank of 5 drop targets. On the left side a spinner sits in the passageway between the two playfields. Various standup targets are spaced around rim of the upper playfield. On the upper left of the upper playfield is a turnaround which when lit advances the bonus multiplier. Cabinet: Colors are green and black on a yellow background. The stenciled shapes are dinosaur/dragon-type creatures. The main idea of this game is to drop the target banks multiple times and then hit the turnaround. It gets pretty boring after that. This game looks so very good, but plays so slow and boring that it is easy to understand why Atari didn't last very long as a pinball manufacturer. Atari made some big mistakes with their machines, but had some good ideas. They placed their main IC boards on the bottom of the main cabinet, which meant that whenever a screw or other shrapnel fell off the underside of the playfield it landed on the board and started shorting things out. They solved this by putting a plastic shield over the board, but that often fell off or was lost. All Atari machines I've seen were in excellent cosmetic condition, which usually indicates that the machines were either boring or were always broken. I tend to believe the problem was that they were boring. On the good side all coils had plug-in connectors so they were easy to replace. I have owned two of these machines. Both were taken on with hesitation, but both ended up working well and were not difficult to repair. Both were also easy to sell, I believe, due to the attractive artwork.